Each Local Association corresponds to a parliamentary constituency. While Associations vary in size, almost all follow the same structure. Officers of the Association are elected annually to positions that include President, Chairman, and two Deputy Chairmen – in the SSCA's case, a Deputy Chairman Political and a Deputy Chairman Treasurer. Most also have officers with specific responsibilities and an Executive Council, which draws representatives from the Wards that make up constituencies. They all play vital roles. They will always aim to achieve our 3 clearly defined political goals above everything else (these goals are mentioned on our home page). Like with any worthwhile Association, there is always a lot of hard work to be done. You can get involved with us as much or as little as you like, but no matter what you want to do, we will always strive to make sure that your time with us is always well spent, and hopefully, extremely enjoyable. Below is a list of things that you can volunteer in to get involved with the Association and with its members. Please contact our office and speak to our staff there (contact details on our home page). If you choose to contact the office outside of its opening hours, then please either leave us a message on our answering machine or e-mail us and we will get back to you ASAP. We will also forward your volunteering request to our appropriate Chairman. If you would like to become a Parish, District or County Councillor, please contact our Political Chairman Mark Sutton. However, if you feel as if you would like to become a member of the SSCA instead of just being a volunteer, please click here to learn all about membership and its benefits. Don’t worry if you have no experience in any of the below tasks! Neither had some of our current volunteers until they joined! On the job training will be given! Our office staff and current volunteers will always appreciate any IT or Administrative help that you are able to provide to the SSCA's Office. There is always a variety of tasks you can assist with such as finance, membership or paperwork. Canvassing is the Association’s way of gaining information about the electorate’s voting intentions, worries and concerns. This information enables us to campaign effectively, and also helps to increase our membership base. If you were to take part you would join one of our campaigning teams. You would visit a specific selection of people within an SSCA Branch, engaging in face-to-face personal interaction with voters. During election times you would also be joined by the Conservative Candidate for South Staffordshire. Canvassing is not only a great way to keep fit, but it also gives you a unique opportunity to get to know people within your area. You would be responsible for an area of houses (usually near or on the road where you live, unless you say otherwise) and would be required to deliver newsletters to those houses when needed. Delivery routes will be provided for you to use. By delivering newsletters, you would be responsible for letting people know what your local Conservative Candidate does for South Staffordshire. It's also a great way to keep fit. We rely on funds raised through the events we run during the year. If you are interested in organizing events and have good ideas, we will be sure to have some way of utilizing those ideas. New ideas and helpers to organize events are always needed, both at Branch and Association level. Events are always fun, very social, and allow members and volunteers to get to know each other and share each other's interests. Twice a year the SSCA creates and sends out a letter and raffle tickets to all of its members, allowing them to take part in a Summer/Xmas Draw. You would be helping the office staff with this process. If you wanted to help, we would let you know when the next draw is being sent out. Donations are a key way in which the South Staffordshire Conservative Association funds its activities. Money donated is used to fund campaigning. Large or small, all donations are very gratefully received - without them we can't fight to improve standards of government in South Staffordshire or nationally. Please either include a hand written message with the form telling us what the donation is for, or send us an e-mail to our office informing us of your donation. Our office's e-mail address is office@southstaffsconservatives.org.uk. You can also use our contact form here to send us an e-mail if you wish. We will always personally thank anyone who sends us a donation. 2. Call our office on 01902 844985 and pay via a debit/credit card. Drivers to collect voters or members from their homes on election days and take them to their polling station. Tellers at each polling station to collect the electoral registration numbers (poll numbers) of voters. People to set up the SSCA's AGM venue on the evening. This includes putting out/away chairs, making refreshments and handing out paperwork (minutes, agendas). People to inspect the membership cards of members as they enter the venue. The details of any upcoming Elections and AGM's are put on our website on our Local News and Events pages. The Rt. Hon. 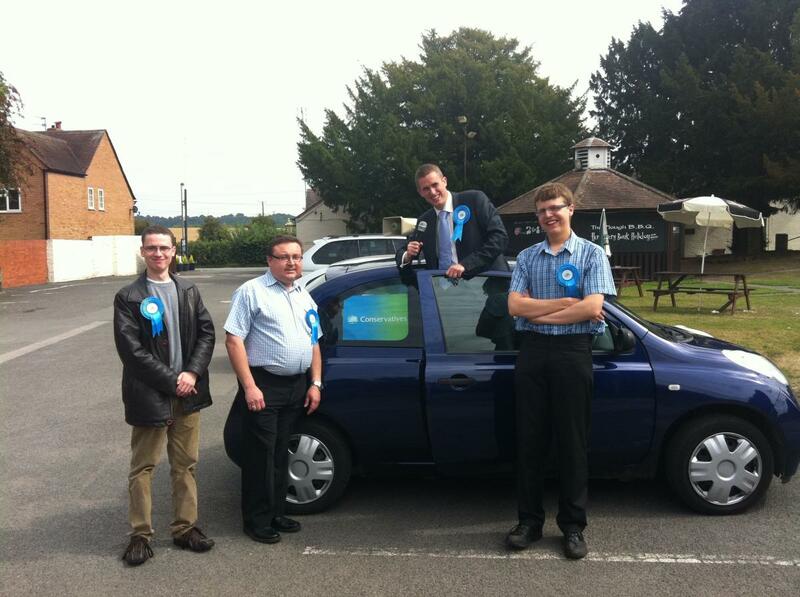 Gavin Williamson CBE MP (South Staffordshire Constituency's MP) and 3 volunteers canvassing hard in Seisdon!